The Z370 Micro ATX ushers in the new era of Intel's mainstream motherboards with performance and features normally reserved for full-size motherboards. Supporting Coffee Lake-S, Intel's 8th Generation Core processors, the Z370 Micro ATX can be driven by up to 6 physical cores + Hyper-Threading. This board contains standard features, including USB 3.0, M.2, Intel® Optane™ support, 7.1 Channel audio, reinforced PCI-e slots, an Intel Gigabit NIC and included Intel Dual-Band WiFi + Bluetooth. However, there is nothing standard about the Z370 Micro's overclocking ability. The Micro ATX features a Highly-Efficient Digital VRM, 8 VCORE phases, an External Clock Generator, and full EVGA E-LEET X support. 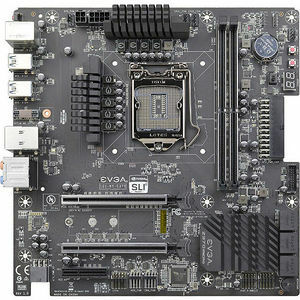 Lastly, a board this powerful would not be complete without 2-Way SLI Support to ensure your dominance over the field. With the EVGA Z370 Micro ATX, mainstream performance just found its new home.